Honey i bought a caravan ! – Dirty wet dog , boats and sailing. Honey i bought a caravan ! In the previous post i was being a bit scathing about caravans and here ‘bit’ refers to the amount of stuff i took out of that post before i published it ! then, a couple of hours later we had to go and pick up the outboard and my partner was giving me a mild telling-off for being so rude. Well its my website and my opinion and even my polite partner had to agree that caravaners can be unusually weird : we have both together been just behind 2 bad accidents with caravans and know of plenty more and that’s just the start. I was recounting this one time when i was on my walking travels : i used to do a lot of long distance and lightweight mountaineering/hiking and was getting in shape for a trip so i was doing distance at speed on the south-west coastal path. It must have been evening because i was looking for somewhere to bivouac and needing drinking water so i sneaked into a caravan park to get a fill from their tap. There were rows of identical looking caravans on flat manicured pitches and from the lights i could see that most were occupied and i could tell that most had TV sets running : the spooky thing is that from the identical blue flicker they ALL seemed to be tuned to the same channel !. My blog here is really all about boats but sailing isn’t the only outdoor thing i have done : i started out as a mountaineer/climber and progressed to ultralight hiking in some wild places and combined that with bushcraft in which i latterly became an instructor and then at some time along the way i added in canoeing an sea-kayaking. With my partner we have done a fair amount of hiking in big country and for non sailing holidays often go off camping and the sites we prefer are often a bit wild, woody and quirky, not at all manicured and we need only the most basic of amenities so the super regimented and manicured caravan sites seem like uncomfortable and austere middle class lawns with all their petty rules, regulations and hang-ups. Just last year i urgently needed to camp one evening when i was away and due to be at an event at the tank museum , i had my basic kit with me and drove onto 2 sites to ask for a pitch….neither site, and i must say they were caravan and camping would even consider accommodating me as i just wanted to rig a fly off the car !, one site warden was even offended by the idea as it ‘might annoy the caravaners’ . I had to drive a lot further but eventually found a much rougher and friendlier site that had no problem with my pitch, offered me a fire-pan and firewood in case i wanted a fire and were just super helpful : so different to rigid and unfriendly caravan sites and their denizens. The tank museum was an awesome day out by the way as i not only got to clamber over and inside several tanks but i got to drive a tracked APC and got a ride in the commanders hatch of the Leopard main battle tank. I am unusual in my family in that i am the only one that has done ridiculous things like hang off the side of cliffs, sail round the world and fall off powerful motorbikes (and survive) as none of my immediate family had ever done stuff like that. I discovered mountaineering through our local club : based in the english fens for goodness sakes ! , got really stuck into that and then discovered sailing when i moved to north wales to work and climb. 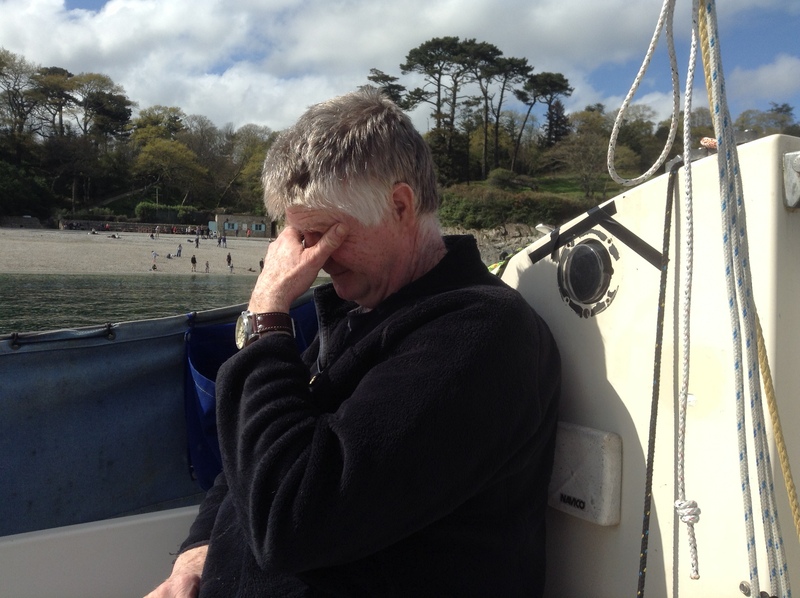 I enjoyed sailing as i was introduced to it by a kind old geezer who took me out in a little dayboat and within a few weeks of that i had been snapped up as rail-meat and winch winder in the local offshore racing scene. Sailing and sailors, or more properly yachtsmen i found quite strange at times as the ones i mostly knew fell into 2 distinct sets…or so it felt. The self-considered elite sailed a local Fife designed dayboat and all they did were their short saturday afternoon race around the buoys and then retire to the yacht club : i mostly thought of them as blazer wearing, gin swilling and socially pretentious boors (and still do) . The group i seemed to be a part of were the offshore race crowd and within that i spent most of my time perched on the rail of a three-quarter tonner crashing, banging and vomiting across the Irish Sea except that when we got there the Irish sailors were some of the friendliest and most welcoming sailors i have ever met…and that includes the Kiwi’s. Many of them were damned good sailors too and i remember too how much my limited world view was altered by just listenning to them talk about the then ‘troubles’. I must add that racing and than sailing the boat back to its mooring gave me a lot of sea miles very quickly . My eventual route in sailing of course took me all the way around the world to return as tough and professional maxi sailor and today i would as much frequent a yacht club as i would a caravan park. Its weird i know but very late on in my club racing days i had to attend an event at the club that i had briefly been a member of : i think we went because we won nearly every local ‘offshore’ race that year and had a shed-ton of silverware to collect. Anyway as we walked in i had an almost visceral reaction to the place and even the skipper noticed that reaction and said “you really don’t like this place do you” and of course its not place but people. Anyway and back to boats. We have been talking about our plans here, both of us have enjoyed the Liberty but both realise that its too small for the things that we are likely to do. By coincidence there is a very ‘non’ caravan boat on the dock next to mine and one that i am very nostalgic about as its a Frances 26 and compared to my boat it seems massive. Thats about the size and space that we need from a cruising boat where we aren’t falling over each other just to cook a meal. I won’t have another Frances although i love them dearly : they are a very expensive niche boat but the size is about right for a long term boat. Having seriously disliked sailing caravans as a young sailing hooligan we now have to consider that one might make a decent if unexciting cruising home so they might be the first boat we take a look at and that’s a major turnaround for me. I admit that it would be a bit like buying a volvo (car) and yes i might have to hand in my racing man-card and yes most of my sailing friend might stop talking to me but they already think i am odd for having owned a Wharram cat (and without the mandatory naked girlies) so there you go ! The way i see caravan boats now is that they were a useful but unexciting development in English sailing, for a long while i saw them as ‘lazy’ boats for a generation of new sailors that couldn’t be bothered to do it properly : part of that was the fact that i was for ever fitting them with roller-blind sails as well which i belived then and now limits them even further. At some time i will also develop this theme that it wasn’t just the fat hull and short fat un-aerodynamic keels, the stumpy rig and a single headsail but that the new breed of owner who wanted a marina experience and a nice ‘safe’ boat were a major factor in this drive to mediocracy in british sailing. Next The blades, the blades. Think very carefully before you tack on the same spot again ……and again….. Wife in one, girlfriend in the other. Great read, thx. Have had the frumpy cruiser and a metre boat, the latter was a joy to see at the dock each time, always lifted my spirits and made me smile. Call me old fashioned but all my other boats were souless, IOR thru bilge keelers. My only keeper is a lean 23′ with one berth, my wife loves the caravan with the heater and separate head. l love her, so the boat is part of the package, bonus prize is she was a good racer annd dinghy sailor. I like the expression ‘Frumpy’ : bring on the gingham curtains !